Rev. William Newton Herold Sr., age 81, of East Grand Rapids, went to be with his Lord and Savior on December 5, 2018. He was preceded in death by his son, David. Surviving is his loving wife of 57 years of marriage, Patricia; son, William (Sherri) Herold Jr.; grandchildren, James and Katelyn Herold; brother Cliff (Pat) Herold; nephews, Tom and Cliff Herold and Tom Amtsbuechler; niece Mari-Clare Culver; cousin Sarah Lea and many other family members. Bill graduated from Central High School, Western Michigan University and then went on to study theology and graduated from Western Theological Seminary. 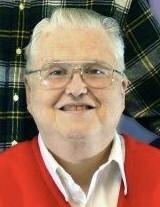 He was the former pastor of Burlingame United Church of Christ. Bill wrote and produced many songs and enjoyed volunteering as a disc jockey. Funeral services will be held at 11am on Monday, December 10th at Christ Community Church, 2400 Forest Hill Ave. SE, Grand Rapids, MI 49546. The family will greet friends on Sunday from 4 to 6pm at the Metcalf & Jonkhoff Funeral Home and one hour prior to the service on Monday at the church.